Jon Jones is once again the light heavyweight champion. He defeated Alexander Gustafsson by third-round TKO at UFC 232 to reclaim the belt. Following the fight, Jones called out Daniel Cormier to fight him at light heavyweight — though he was subsequently booked to fight Anthony Smith at UFC 235 on March 2. Smith is on a three-fight winning streak since moving up to light heavyweight, with wins against Rashad Evans, Shogun Rua, and Volkan Oezdemir, and will now have his toughest fight to date at UFC 235. While some the oddsmakers seem to be sleeping on Anthony Smith, Jon Jones’ coach Mike Winkeljohn sees the streaking contender as a dangerous test. 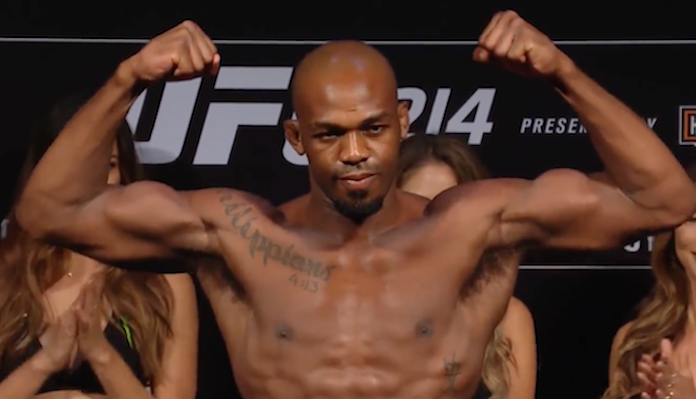 Jon Jones’ quick turnaround came as a bit of surprise to some. However, according to Winkeljohn, that has always been the plan since Jones came back from suspension. Back when Jones was first the champion, it wasn’t out of the ordinary to see him fight three or four times a year, and that is the plan in 2019 for Jones. Jon Jones’ busy 2019 starts against Smith at UFC 235. If he gets by Smith, some fans are hoping he’ll move up to the heavyweight division, perhaps to rematch Daniel Cormier. Yet according to Winkeljohn, that doesn’t seem like it will happen as Jones wants to stay at light heavyweight for the foreseeable future. That can all start on March 2 when he fights Smith. The plan for the fight is simple. Do you think we’ll ever see Jon Jones move up to heavyweight? UFC Events Pick Em Contest!